Submitted photo Jake McCubbin, who ran cross country for WSU from 2008-12, won the 22nd Annual Air Force Marathon, Sept. 15 at Wright-Patt Air Force Base. FAIRBORN — Jake McCubbin, who ran for the Wright State University cross country team from 2008-‘12, won the 22nd Annual Air Force Marathon, Sept. 15 with his personal-best time of 2 hours, 35 minutes and 57 seconds on the Wright-Patt Air Force Base. McCubbin, a graduate of Northwestern High School in Springfield, did not compete in 2009 due to an injury but was very competitive throughout his Raider career. His time Saturday was almost 12 minutes off his previous best time. 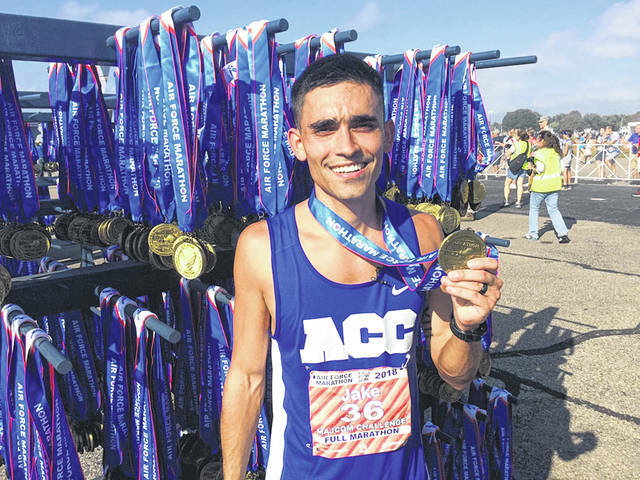 Currently living in San Antonio, Texas with his family, McCubbin will start a four-year assignment at Wright-Patt in November and hopes to run again with his college friends. He also put in an application to be selected to the All-Air Force team. If accepted, he would compete on behalf of the Air Force and compete against other military branches at the Marine Corps Marathon in late October in Washington D.C.
WSU is where he met his wife Ellie (Holsopple), a former student-athlete on the cross country/track team. They have two children, Myla (3) and Merritt (eight months). For more information on Raiders athletics go to www.wsuraiders.com. https://www.beavercreeknewscurrent.com/wp-content/uploads/sites/49/2018/09/web1_McCubbin.jpgSubmitted photo Jake McCubbin, who ran cross country for WSU from 2008-12, won the 22nd Annual Air Force Marathon, Sept. 15 at Wright-Patt Air Force Base.